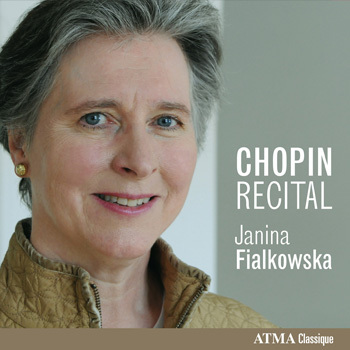 Thrillingly different - Ostensible miniatures full of great art Janina Fialkowska plays her Chopin with superior perfection, which never exhausts itself in technical matters. She reigns for example in the way she designs the waltzes, over a richness of colors and a variety of touch. With these she draws out great art from the seeming miniatures. In this almost casual way of creating suspense she gets close to Chopin experts such as Rubinstein and even Horowitz: it is the sensual shading of the moods. Fialkowskas playing wins over, as she already displayed in both her former Chopin-Recitals, with her intellectual clarity coupled with intuition, something not always managed by virtuosos. For a contemporary Chopin concept, and if you don’t absolutely need the usual dreamy soulful agony, a real treat. The Grande Dame of the piano, Janina Fialkowska … approaches the richly profound composer respectfully, but with a powerful signature grasp. Especially the four late Impromptus op. 142 are turned out with unpretentious clarity that is so authentic and clear, it is a joy …Janina Fialkowska succeeds in this tightrope walk above the abyss impressively and conclusively. Even in the elfish f-minor conclusion of No.4 there remains still a lot of thoughtfulness, which only reinforces the overall impression. A noble distance which is most becoming is also found in Fialkowska’s interpretation of Schubert’s 7th piano sonata Op. 122. 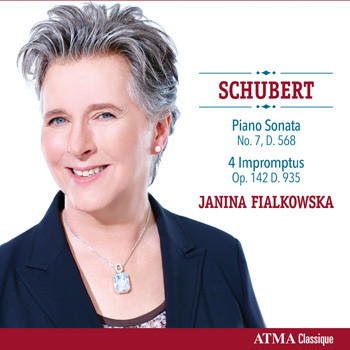 Janina Fialkowska´s Schubert-CD is a gift. Perhaps even for the pianist herself. But for sure for us! ... in the meantime Janina Fialkowska has become a “Grande Dame” of the piano. With Chopin, too – but not only. Recently she presented a sensitively played Grieg recording. Also her first Schubert-CD three years ago was met with high acclaim … she knows that with Schubert there are abysses lurking and that real depths of emotion become evident only gradually. The pianist uncovers those treasures painstakingly and she transforms them with great mindfulness into the audible. Also with the Impromptus, op. 142 she leads us through the heights and depths. "... this patrician pianist at her unfaltering best ...With warm plush sound and truly splendid notes we join in wishing Janina the best for her 65th birthday. She continues to look and sound like the consummate artist she obviously is." This new recording of Franz Schubert is a must for anyone who loves his piano repertoire. Janina Fialkowska is a veteran performer and recording artist who at age 64 continues to mature and develop. ... an example of familiar repertoire rethought, reconsidered and reinvented ... Fialkowska gives Schubert’s simple ideas an airy freedom that feels so completely right. She is, as ever, the mature interpreter we have come to admire." Jouant splendidement de son toucher léger et timbré qui m’évoque toujours celui de Lili Kraus, elle [Janina Fialkowska] se promène ici avec une intelligence des doigts et du cœur qui me confond'. .. the performance of Canadian pianist Janina Fialkowska is remarkable. Like -e.g.- Mitsuko Uchida and Radu Lupu, she shows an innate sense for investigating the lyricism and expression of these sonatas, which she performs eloquently and well-considered. She also does this in a completely natural way, without emphasis and with great attention to structures and details. A valuable addition to the Schubert sonata discography is the result. … the Montreal born pianist is an insider’s tip … mature poetry … Fialkowska plays the piano devilishly well … this great artist always takes a step back from the music without leaving a feeling of neutrality. She combines nobility, elegance and a sense of style and all of that always very warmhearted. … her abilities to display delicate moods, to combine sensibility with elegance and to feed the flames of her pianistic fire … thoughtful as well as discrete, cheeky at time, crystal clear, vivacious even showing off. Just the right thing for the art of characterization of this pianist. … shapes Grieg’s short episodes with flexibility and organically and above all with a profound foresight ... … the ideal guidebook for the ears to Norway in the summer. Time and again Fialkowska’s conceptions recall her mentor Arthur Rubinstein’s late-period Mazurka playing in regard to lyrical breadth, a thoroughly internalized rubato, and an ability to savor felicitous details without exaggeration or overly lingering. … how fresh Schubert sounds … Janina Fialkowska is a jewel ..
… this is her first Schubert offering, and introduces a level of Schubert that sits up there with the likes of Uchida, Cooper and Brendel … Fialkowska is clearly as attuned to Schubert as she is to Chopin. … a refreshingly clear sense of structure and clarity … with an absolutely sure sense of where she's going … leading the listener unerrungly through the most extraordinarily varied landscapes, while the wispy ending is simply breathtaking in his hands. ... filled with light and possessed with a magical transparency … Fialkowska crafts pure poetry … she knows exactly when to be bold and when to pull back and drape a silken veil over her keyboard … Wow. … crystalline clarity and purity of sound …. is absolutely exquisite and I thoroughly recommend that you seek it out if you can ... in short this is a disc to treasure, and I know I shall be returning to Fialkowska’s playing often to savour her elegantly refined approach to Mozart. What an artist! … the piano here sparkles, there are subtle trills, it’s charming, effortless, it has 'esprit' and it’s rich in nuances … with special delicacy and great taste. Finally also in Europe, Janina Fialkowska's time has come! Fialkowska’s treatment is crystalline and unsentimentalised, lending the music a spontaneous fluency that is invigorating! … effortlessly, technically brilliantly and with a tendency, to let the music sound more inward than outward … she phrases elegantly … the most beautiful really is how she softly and clearly develops melodies, how she always subordinates the hellishly fast chains of coloraturas in Mozart’s fast movements in favor of the melody. A must-listen for even the most avid of Mozart fans. … her performances blaze and challenge with a potent and highly individual sense of drama ... her F minor Fantaisie is of a grandeur rarely met with on disc, her Second Scherzo, broadly paced, of a quasi-symphonic breath and weight. Even the Op.64 A flat Waltz, you sense an underlying unrest, and if Fialkowska sometimes bears down heavily on some of Chopin’s more intimate and fragrant utterances (the Op. 55 Nocturne’s elegant and multi-directional tracery), there is never any doubting her strength of purpose. … this is a rich and illuminating find. From the outset you sense Janina Fialkowska’s innate, developmental grasp of drama – of the connection between phrases and their dynamic character. Then there’s the sheer life in her playing, reflected in the perfectly nourished and shrewdly apportioned sound, unmarred by any hint of coarseness or ill-defined tone. Without exaggeration she reveals the deep humanity of Chopin’s counterpoint, in which every strand plays an expressive role. She has a grasp of polyphony (never more evident than in the bewitching E-flat Nocturne). True to Chopin’s spirit, the playing is everywhere informed by a classical sense of proportion. Yet her pacing and exceptional grasp of musical narrative is a masterclass in the art of pianistic rhetoric. 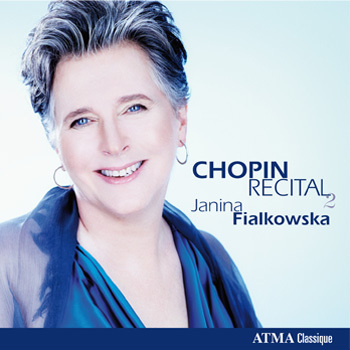 Pianist Janina Fialkowska, whose career was nearly ended 10 years ago by cancer in her arm, shows her total recovery in one of the finest Chopin recitals given in 2010, the anniversary year. There are spellbinding performances of the E flat Nocturne and the F minor Fantaisie. Three Preludes include the evergreen F sharp major, its subtle mood changes clearly delineated. But for Chopin-playing of supreme quality, try the F major Ballade and its storm and stress. Fialkowska is ready to expose both the explosive and the deeply intimate by pushing the piano to its technical limits from massive volume to notes that are barely played. It’s an all-or-nothing approach with immediate impact. … Fialkowska is an international treasure, showing setting an example for the world how the music of Frédéric Chopin can be played with virtuosic fire as well as elegant grace … there is never a single note or emphasis or contour out of place as this remarkable pianist shows off her impeccable technique and sophisticated artistry. Outstanding Chopin. No wonder Arthur Rubinstein thought Fialkowska worth mentoring when she was a youngster…… lovely combination of intimacy and grandeur, idiomatic fluidity characterizes the finest Chopin playing. … returns to the composer with results that are just impressive. She treats shorter, simpler pieces such as the Waltz in E minor with just as much respect as bigger beasts such as the Fantaisie in F minor and the Scherzo No.2 in B flat minor, often finding a heart-stopping simplicity that is just as difficult as keyboard heroics. Here is suddenly a disc of Chopin which displays all the qualities which must have touched Arthur Rubinstein and made him, years ago, adopt the young woman. Fialkowska speaks directly from the heart, there is no filter and nothing artificial. The works spring forth as if they were newly composed, unencumbered by all the baggage of heavy tradition. Freshness, enthusiasm, luminous playing, and above all, this simplicity which avoids making an overly big deal of every note. It is Chopin without an instruction manual. A supreme gift, we listen once again to these splendors as if it were for the first time. There is no exaggeration or overreaching, every expression is chosen wisely and at the same time sensually, rounded, singing, born out of technical clarity. Herein one can feel that Fialkowska is aware of Arthur Rubinstein’s giant Chopin-heritage. He was crucial to her career after her prize-winning performance at the first competition in his name, but at the same time she makes her own, true points without trying to reinvent the wheel. Gounod/Liszt: Waltzes from the Opera "Faust"
… this is a recording of urgent importance ... The Bénédiction has an interior quality worthy of the likes of Arrau. The Gretchen is perhaps even greater; Fialkowska captures the echt-Lisztian mode of utterance perfectly, and her concentration easily sustains the 20-minute span. The Liszt/Chopin Chants Polonais sparkle and are up there with Cortot ... the recital ends with a glittering Faust Waltz. … only a few have saved Liszt’s piano music from its empty virtuosity as elegantly as Janina Fialkowska. So demonstrated here: temperament and nobility do go well together. This is one of the year's definitive tributes to Franz Liszt, whose 200th birth anniversary falls on Oct. 22.2011 … the full magic of Fialkowska's performance comes from being able to earnestly render Liszt's caresses and sighs with a determined energy, and to carefully dissimulate the technical hurdles (and there are many) with a gauzy, ethereal peace. This recording arrived late in the jubilee, but it is one of the most interesting inspired by the Liszt anniversar …thus the pianist succeeds in creating an unusual as well as bewitching musical contribution to add to the “resounding” (birthday) congratulations. Every single piece has its character by means of color, rhythm and articulation. Perfection is a means to an end. Janina Fialkowska inhabits a castle of sound. She built it with her magical hands. ... parmi la pléthore d'enregistrements consacrés à Liszt c'est l'un des très très bons grâce à la distinction naturelle et à la grande élégance de Janina Fialkowska. Her Parisian training in the tradition of Alfred Cortot becomes evident by her pearl-like playing. She owns a huge spectrum of colors, the phrases breathe and sing, and her natural virtuosity is never an end in itself but always serves the expression of the music. Her Liszt is wonderfully assured and expressive. 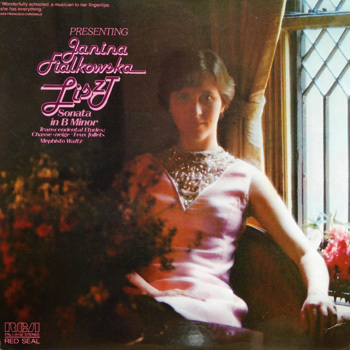 However something as wonderful and rich which interconnecting relationships as the compilation with which Janina Fialkowska celebrates the master is without question anything but a nine day’s wonder created for the Liszt anniversary. In lyrical pictures and with a warm sound but above all with an intelligent dramaturgy she describes the spirit of romanticism, the friendships between artists and productive competition. She opens a world of ideas: Chopin, Gounod, Liszt - literature and musik cross and inspire each other in this cosmos of sound: fascinating and virtuoso. … plays from the heart … Fialkowska produces a winning recital to crown the Liszt bicentenary. It comprises some of his lesser-known works, which the Polish-Canadian pianist turns into music of warmth and substance … Fialkowska’s strengths – her romantic sensibility, her sense of poetry, her unaffected artistry and knack of showcasing the music’s Chopin-esque brilliance. … blends drama with lyricism. This is classy playing. … here is one of the best Liszt recitals of the year. Canadian pianist Janina Fialkowska has stormed back from an illness stronger than ever; the fierce demands of this program shining a light on Liszt as few do … Not to be missed. … sheer magic. Was there ever a more deeply felt Bénédiction and a more tender Gretchen? No, surely not. Her way with the slight Chopin songs is above any criticism. Could be the finest Liszt release we will see this year? I think I’m now a paid-up Liszt fan. Her style is superior and artistic. … by such luminaries as Horowitz, Richter, Bolet, Arrau, or Cherkassky. Fialkowska stands up well to any such comparisons with her intelligently programmed recital, her extraordinary ease of mechanical execution, and most importantly her engaging way with the music … this is spectacular playing … Fialkowska brings elegance, brilliance, and sincerity to this very performance-oriented music. She reveals details that only a mature artist and polished technician can. 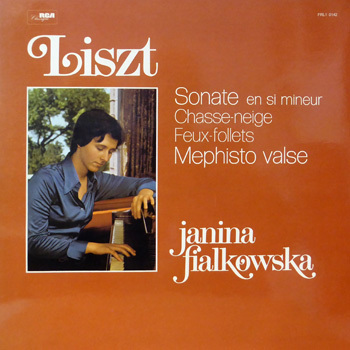 Chopin specialist Janina Fialkowska always had a weakness for Liszt. To her his piano music is anything but a seduction by cold keyboard magic and she demonstrates it in this cleverly put together recital. A Liszt full of richness of colors and depth. ... among the abundant new (Liszt) releases there was nothing very earth-shattering other than Aimard’s Liszt-Project and the comeback of Canadian Rubinstein student Janina Fialkowska, which were the exceptions to the rule. Fialkowska produces one of the outstanding highlights of Chopin Year … Indeed, lesser mortals may well weep with envy at such unfaltering authority and I hesitate even to imagine the hours of work behind such magnificence … her B minor Sonata is as thoughtful as it is masterly and if I occasionally missed the seductive tonal allure and magical “cantabile” of a Cortot or Perahia (most notably in the Largo), I was filled with admiration for such clarity, strength of purpose and musical integrity … she has done her one time mentor, Arthur Rubinstein, proud. All Fialkowska’s distinguishing characteristics – style, finesse, temperament, attitude – are here. She knows how to generate a thunderous sound without swamping the music, as demonstrated by her powerful rendition of the Third Sonata’s finale. Janina Fialkowska is a terrific Chopin interpreter. Her playing is precise, transparent but nevertheless infused with a unique warmth and sense of poetry. Wonderful to be able to listen to those often heard pieces with a feeling of ecstasy and enjoyment. These recordings .. plain and without frills are a true sensation and should convince, if not overwhelm, the last skeptic of the human magic of her playing due to the outstanding musicality, the incredible pianistic profile and the unique charm of this exceptional pianist. As far as I am concerned I don’t know of any recording of those two etude cycles of such an electrifying directness, of such a poetic power of narration, of such an inner emotional freedom and of such a pulsating agility. In comparison to her etudes the recordings of the CD heroes so far like those of Pollini, Ashkenazy or Gawrilow, appear like little wound-up robots or muscle loaded bodybuilders, who try to impress with their technique. Fialkowska is a gifted storyteller who searches for the human truths behind the glittering facade, for the pools of deep melancholy and for the small and big outbreaks of despair. These she then shapes with stunning directness and many layers of clarity doing so also in the important accompanying voices or in the often neglected “opposing world” of the left hand: her dynamics are dramatic and her rubati are from another, more human world and she permits herself occasional small rhythmic aberrations which only then gives us a sensation of Chopin’s inner fire and the abyss of his soul: we become a part of it and we suffer along with it. However what impresses the most is the simple, natural, absolutely unadorned poetry of her sound which combines warmth with clarity, feeling with intellect, pacing with clear structures. All of this (supported by the truly excellent sound engineer) creates acoustically an intimacy with the listener, conveying the impression that she is playing for him or her personally, without the protective barrier of a stage: a magical intimacy, a sensual immediacy, exactly Chopin’s preference and for what he was always searching. This wonderful jewel, this spiritual journey into the composer’s soul, this enchanting private encounter with Chopin, nearly remained unknown to us. So, after all, there IS something to celebrate in this pitiful Chopin year. I even pressed play a little half-heartedly, fully expecting to spend my flight time shuffling from selection to selection as aimlessly as I shuffled through the retail outlets of American airports. 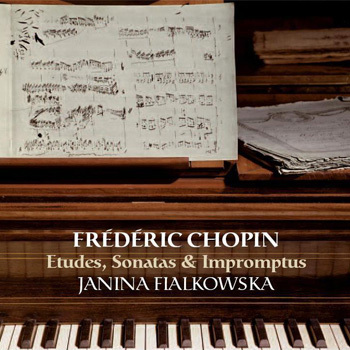 But almost immediately I knew I’d struck gold: Janina Fialkowska’s Études, Sonatas & Impromptus2010 recording of Frederic Chopin’sÉtudes, Sonatas & Impromptus on Montreal’s ATMA Classique was the perfect travel companion. Trust me on this: you can’t possibly do better. Fialkowska is a national treasure. It's not often that one has the opportunity to hear a very fine pianist transformed into a great one. before one's very ears. Hers is truly edge-of-the-seat playing that fully captures the excitement of encountering these formidable works for the first time. There are occasions here – Op.10 No.10 and Op.25 No.6 in thirds, for example, where the technical effrontery of it all inspires and elated sense of wonder. And again one is captivated from her first tone and at the same time one is enchanted by her ability to model actual “meaning” of the music behind Chopin’s endless flowing singing lines and make them speak directly. It sounds, as if we would be with our inner ear right at the source of all these small and big inner dramas, those wonderful, vivid, compelling alternating plays of heroic and sensitive thoughts and feelings. 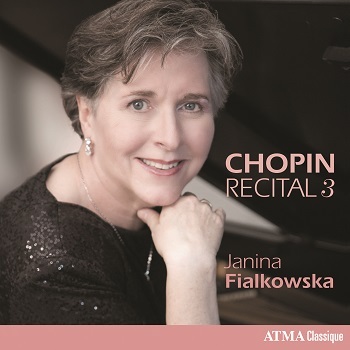 Janina Fialkowska’s very strong interpretation … Fialkowska’s brilliantly limpid and mercurial playing is totally authoritative, and, given the piano’s dominance, she makes these familiar works sound fresh and compelling. Fialkowska’s playing is elegant but not too sentimental. Rubato is never clumsy or excessive, and she handles the trickier passages with flawless abandon. Her articulation is exceptional, especially in the briskly played finales. … this one is destined to join it as a definitive concerto disc in the closing stages of the composer's 200th anniversary. Chopin's two concertos are fresh-minted in her hands, such is her marvellously mercurial playing. If you thought you knew all there was to know about these concert-hall warhorses, you haven't heard Janina Fialkowska. Janina Fialkowska must be heartily sick of being linked in the critical and public imagination with her mentor and early champion Arthur Rubinstein. In many ways, however, she has only herself to blame. Not because she flexes the connection (she doesn’t), but because her playing, particularly in recent years, breathes more than a little of the same air, both expressively and pianistically. She exaggerates nothing. Her playing is notable for its balance, its sense of proportion and naturalness … like Chopin himself, she never forces the sound. Her tonal palette is rich, and richly varied, but she never indulges it for its own sake. On the whole, these splendid, earthy, vital performances make for rewarded listening. The “live” situation might have caused additional inspirational motivation, because even more than in her fine recording of the concertos in chamber version, Fialkowska presents herself above all as a master of communication … each tone, each phrase, each thematic structure has such an eloquent intensity, is so full of life and impulse, it makes one believe one is hearing these concertos for the first time – and we are talking of concertos that have been played over and over again! … How tastefully Fialkowska lays out the timing of this music, how, with luscious radiance she unfolds the colors and how well she understands to emphasize dramatic accents in perfect proportion to the lyricism of the works, how she never loses concentration and how she fulfills and feels with seriousness any, even seemingly unimportant gesture, all of this making her a unique interpreter. 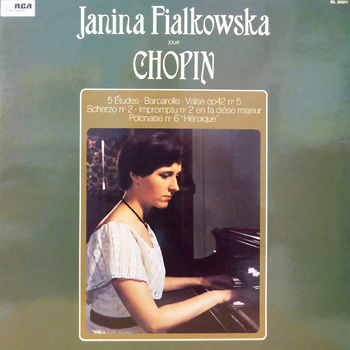 … demonstrating again her imaginative command of the idiom, in a way that underlines Chopin’s Polish genes rather than his French sensibility… The disc is worth the investment just for the richness and vitality of Fialkowska’s pianism. 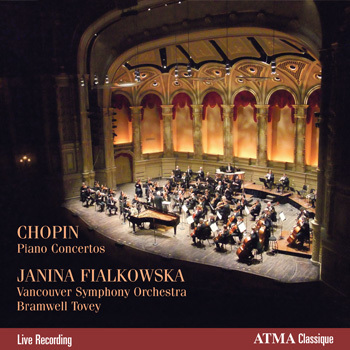 Canadian virtuoso Janina Fialkowska has recorded Chopin’s piano concertos before for Atma, in versions for piano and string quintet. These were revelatory but not nearly as eloquent as her new recording with the Vancouver Symphony Orchestra of the conventionally orchestrated versions of the concertos. Chopin’s muse was Italian opera, and this is unmistakable in Fialkowska’s playing, which is so much less self-consciously pianistic than most Chopin interpretation. Her right hand sings with a clarion tone, and she toys with the melody just as a diva might, alert to the drama of the individual phrase. Fialkowska also articulates, her touch less consistently legato: Not for her the seamless melding of phrases into long, artificial, romantic trajectories. The recitative in the “larghetto” of the F minor Concerto doesn’t sound like a passage influenced by recitative; it sounds like the real thing, an accompanied recitative transferred directly to the piano, its theatricality intact. … some of the best Chopin discs are the late arrivals in the composer's waning 200th anniversary. 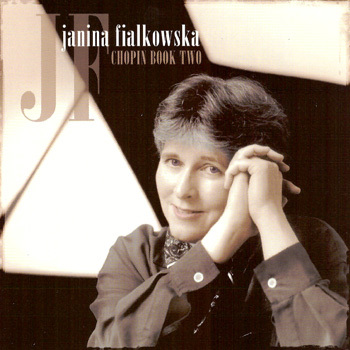 Canada-based Janina Fialkowska has made more than her share of distinguished Chopin discs, but perhaps recording live with an orchestra has inspired her to surpass herself in a manner of playing that exercises daring flexibility, allowing her to sparkle in the extreme one minute and reveal her soul the next. Somehow — and partly thanks to conductor Tovey — she maintains long-range sweep of the pieces. Among recent Chopin concerto discs, this is among the best. My own choice recording this month is another disc of piano concertos on the ATMA label, featuring Janina … there is an energy and élan to these performances which literally jumps out of the speakers. The warmth and depth of sound capture the music in all its grace and grandeur and none of the nuance is lost … In fact the audience is so enraptured of the performance that even listening on my full frequency range headphones I was not aware of their presence until they burst into applause. ... Fialkowska was always one of those “best-kept secret” pianists, loved by connoisseurs for her tonal refinement and exquisite musical taste … Fialkowska reveals herself as a great Chopinian poet who can make the piano sing and dance … Her immaculately judged rubato never sounds calculated, but respects the bel canto inspiration of Chopin’s haunting melodies. In every respect, this carefully chosen and balanced programme repays repeated listening. This is some of Chopin’s greatest music and the playing is sheer bliss. If you buy one Chopin selection this year, make it Fialkowska’s. her technique is fearless … this is high-class Chopin playing, deeply felt and demonstrably authentic. … all played with a stylish confidence and underlying power. Even though these are all well-worn pieces, Fialkowska makes each sound fresh. Brilliant and highly virtuoso recordings ... an unusual testimony of the Art of perfect pianism. Fialkowska plays Chopin with a warmth, poetry, and detail of phrasing that is disappointingly rare today; she places her gifts at the composer’s feet. She moves through a selection of waltzes, preludes, and mazurkas with aplomb, which is hardly surprising since she began her career as a protégée of Arthur Rubinstein. Could the excellence of this CD be in part due to Fialkowska's pianistic rebirth, after ground-breaking surgery to cure cancer in her left arm? Her technical brilliance is matched by the vivid originality of her interpretations. This medley of waltzes, nocturnes, preludes, and scherzos has a wonderful freshness. The Chopin 200th anniversary has already thrown up its share of CDs, but I wager it will produce nothing more enjoyable or recommendable than Fialkowska’s recital … this is a CD that rewards repeated listening. No one plays a more refined Chopin these days. With a mixed program the Canadian pianist transports the listener back into the salon with her fragile and “feminine” art of piano playing. In the post-crisis single disc recital from 2008, her sound is richer, deeper, more varied; her rhythm is stronger, and her colouristic palette is wider and more perfectly controlled. There is a new and unmistakable joie de vivre, an almost improvisatory abandon and, frequently, a sense of sheer unbuttoned fun not normally associated with either Fialkowska or Chopin. She shows a greater flexibility and buoyancy of rhythm, yet without losing sight of the whole. The artist, who was supported by Arthur Rubinstein is not so well-known in this country … the magnitude of this oversight of a music business that seems to be completely dedicated to the teenage cult, is brought to light by Fialkowska’s latest CD-Chopin, which appears like a spectacular discovery. What convinces and at the same time deeply movesis the simple straightforwardness of these recordings … what is so fascinating about Fialkowska’s play is the naturalness, the seriousness and the integrity of her master plan and it is the emotional richness displayed with tremendous beauty of tone without any cheap showmanship. This recording is without any doubt one of the most beautiful contributions to the Chopin anniversary. Coming somewhat in advance of the flood of pianistic activity that will mark Chopin’s bicentenary, this refined and unfussy recital is therefore doubly welcome … Fialkowska simply takes Chopin’s notes on their own terms, inhabiting fully each transient area of exploration but never pushing the matter too far. This is a generous, well-chosen, and well-ordered group of pieces that includes the Barcarolle … I listened to this recording many times, in several different venues and came away on each occasion feeling enlightened by some of the most elegant Chopin playing I’ve heard in some time … this is a Chopin lover's disc that will deliver something new even to those who have heard these pieces many times. … her masculine keyboard energy is undiminished and her feminine subtleties as seductive as ever. This Yin and Yang are so beautifully balanced in her interpretations that one quickly forgets the performer while being drawn deeply into the swirling emotions that make Chopin’s music unique. Stepping out of the way of the music is something Fialkowska does with clever and manipulative grace. 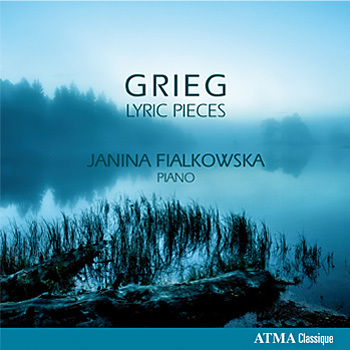 One easily takes the bait offered by her technical perfection and is drawn toward the fiery melancholy of Chopin’s world … this is a high risk interpretation but carried off convincingly because Fialkowska’s Polish roots run deep and true – and her musicianship is impeccable …this disc should definitely be a part of your Chopin collection. … un disque magistral, viscéral, qui touche profondément l’auditeur, avec un aplomb supérieur à tout ce dont on se souvenait d’elle. Pianist JANINA FIALKOWSKA is her usual classy, elegant self. She’s articulate with clear ornaments and beautiful shaping. The piano sound is bright and full. All around - another winner for them. Five out of five. … the pianist Janina Fialkowska wins us over by her delicate touch and phrasing that is both poetic and luminous. Her playing is a palette of light rather than color, and perfectly illustrates what musicologist Theodore Baker said, which is that Mozart in fact is the “supreme musical genius whose works have remained unequalled as much because of their beauty, their lyricism and their rhythmic diversity as because of their melodic invention.” A got-to-have. … Janina Fialkowska is a fine Mozartian … she finds the crossroads of simplicity and lyricism; the style is neither naive nor arch … but neither is it middle-of-the-road! Janina Fialkowska and the string ensemble achieve an almost perfect consensus in their playing…As always, the playing is of the highest quality. In March, pianist Janina Fialkowska and her favourite chamber-music collaborators came to the Glenn Gould Studio to seduce us with two Mozart piano concertos that the composer had reduced to salon-size forces. This disc, recorded shortly afterward, captures the same magic of impeccable musicianship and transparent phrasing. What was created here is an opalescent mixture of chamber musical intimacy and concert brilliancy, of concentration on musical soundness and virtuous joy of playing. This recording with Janina Fialkowska is one of the most successful contributions to this niche repertoire I ever encountered. Phrasing, touch culture and articulation are proof of the pianist’s Mozart experience. Fialkowska maintains a luminescent, pearly legato tone at all dynamic levels, her cantabile phrasing creating the enchanting impression of musical droplets falling gently from the sky. Yet her fastidious attention to detail never draws attention to itself but rather serves as the perfect mechanism to facilitate readings that affectionately draw the listener in while maintaining Classical equilibrium at all times ... this comes highly recommended. … her interpretation of the beautiful slow movement to the F Minor Concerto, where the opening wind entries are taken by the piano … is a case in point. The biggest change is in immediacy, for a smaller, more flexible accompaniment permits more rhetorical detail, consistently moving the sentimental focus from the general to the particular. Even modest string melodies carry more import, and Fialkowska makes every note, however ornamental, significant. Longtime champion of the music of Chopin, Janina Fialkowska plays these superb as well as familiar works with full romanticism. The technique is impeccable, the scales flow, the melodies sing, the folklore dances. 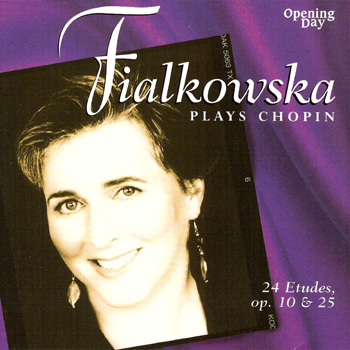 Returning to the music of Frédéric Chopin she has so often championed in the past, she has produced not just another recording of the two piano standard concertos but a unique one … Fialkowska could hardly have chosen a more suitable project for her return to recording and has risen to the challenge of the music with real distinction. … le disque de Janina Fialkowska est tout à fait recommandable … son jeu est toujours musical, énergique dans les mouvements rapides, poétique dans les mouvements lents, et avec, partout, des trilles très nets. The greatest impact of this setting is its significantly heightened sense of intimacy. In the slow movements of both concertos, the E minor especially, these sparse strings make the piano line compellingly poignant - breathtaking at times. Expect a sniffle and some tears. This is wonderful playing... we are listening to a miracle. 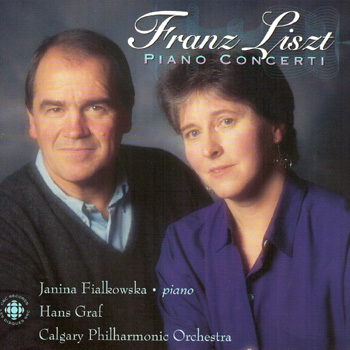 Janina Fialkowska has always been one of the few pianists who makes me like – sometimes even love – Franz Liszt. The Canadian-born pianist is also one of those rare musicians who, in the age of digital micro-editing, makes on-the-edge- recordings that capture much of the spontaneity and risk-taking of her live performances. And Fialkowska is in full flight in this new recording … … she goes straight for the poetic heart of the pieces, in open-hearted, fresh and emotionally charged performances that are so free of gratuitous bombast, excessive sentimentality or virtuosic posturing that they will win over even the most hardened Lisztophobe. … highlight of the season. Janina Fialkowska is a formidable pianist, as indeed one must to be tackle Liszt’s most formidable work … Her technical brilliance is combined with an engaging musical flair and a feeling for colour and drama of the sort absolutely required in this of all music … She gives one of the most colourful and idiomatic traversals of recent years. D’une virtuosité électrisante tout au long du disque … une remarquable netteté des couleurs sonores ; ainsi qu’une prodigieuse faculté d’adaptation aux atmosphère changeantes de ces études … Pour Arthur Rubinstein, entendre Janina Fialkowska fut une révélation … Après écoute, on peut très bien comprendre, à plus d’un égard, l’enthousiasme de Rubinstein. Fialkowska is pianistically the master of the singing melodic line, which she moulds with the eloquence of Maria Callas singing bel canto. In pure technique, the challenges of Russian piano composition – which often seemed the more insistent half of these songs – held no terrors for her. … et la pianiste la porte avec une tendresse digne de l’intimité du décor d’une belle datcha. Her interpretation of the beautiful slow movement to the F Minor Concerto, where the opening wind entries are taken by the piano (thus establishing it from the first as a protagonist) is a case in point. 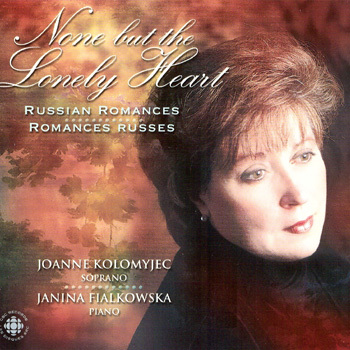 … the gleaming romanticism of Janina Fialkowska as her pianistic collaborator is similarly heaven-sent. As a musician she combines high intelligence with a big virtuoso technique and a great flair for the romantic repertoire ... unique and splendidly played .. So here is a richly satisfying cycle that may stand beside any others on your shelf, further distinguished by solid orchestral support from the Calgary Philharmonic and a dark, rich recording that sets off the crisp tang of Ms Fialkowska’s solo instrument most effectively. Here’s the best way I know to obtain all three Liszt concertos and enjoy the Hungarian Concerto into the bargain. Her expressive playing - Liszt is not all hammer and tongs - can almost be construed as a revision. An encyclopaedic review of Liszt’s concerto works, superbly played by one of the foremost Liszt pianists of the day. The beautiful music on (this) release is matched by very beautiful playing, entirely of the kind, one imagines, that Chopin himself would have admired. Fialkowska's formidable technique tends to make these extremely challenging works seem effortless, natural, and most of the time, spontaneous. ... Best of all, she is able to communicate her deep psychic identification with some of Chopin's most gripping works in terms of elevated expressivity, elegance, and drama. This disc could well prove to be the premier Chopin release of the present decade. Vital, intelligent readings. It's an invigorating display, with Fialkowska's superb technique piloting everything unfailingly and Chopin's vast range of drama vividly explored. As with everything from Fialkowska, a strong recommendation. I enjoyed the sonatas very much. The B –flat minor is imbued with passion and drama … In fact, all of these performances sound fresh and new, bold and forthright. … the Polish-Canadian pianist Janina Fialkowska has broadened her style, and her performances of both works are as affectionate as they are masterly. Here the considerable qualities that marked her first … are extended into an altogether more dazzling relish and brio, even a touch of dare-devilry. She plays the Piano Concerto's second subject with a special sense of its intimacy and spins off Paderewski's icing-sugar figuration with an open-hearted delight in its sparkle and charm. The cadenza in particular is unfurled with great brilliance and the sort of improvisatory flair that in the past sometimes eluded her, and the final sprints of both works are given with a genuine rush of adrenalin. Native soloists Ewa Kupieć (Koch International) and Janina Fialkowska (Naxos) have provided brilliant, dexterous performances that also take in supple, expressive phrasing. Fialkowska brings dash and flair to this pairing of the two works Paderewski wrote for piano and orchestra. Neither (piece) escapes the influence of Chopin and Liszt, but there is a robustness of colouring, tinged with Polish folk inflections, which gives them a personal stamp. The vigorous piano writing, designed for maximum impact, gives opportunities for Fialkowska to display her own virtuosity. Fialkowska brings us the first budget-price version (of Paderewski's Piano Concerto) and lavishes her considerable resources on both the concerto and the lively, attractive Polish Fantasy. Paderewski's Piano Concerto of 1888 is a lovely work, a vehicle for virtuoso display, as is the Fantasy. Janina Fialkowska is an articulate and sensitive soloist. This is fresh and unpretentious music, and richly orchestrated. Fialkowska plays with natural grace rather than bravura. It is the right approach. Recommended. Janina Fialkowska has not only a marvelous interpretive affinity for this music but the technical chops to match. Paderewski's Piano Concerto has many charming melodies, tremendous bravura passages and plenty of interesting interaction between piano and orchestra … most attractive disc. Taken as a whole, Fialkowska's Études are as brilliant as any complete set I have heard: disciplined, transcendent Fialkowska is one of the few who has somehow managed to strike a happy medium between the styles of the two greatest pianist-composers of the romantic age (Liszt and Chopin)! Her style and approach to the piano in Chopin are close to Rubinstein's, which in itself is a supreme compliment. Tossing off the Études daunting technical challenges, Fialkowska turns her attention to their imaginative possibilities. The result is personal, visceral interpretations that capture much of the excitement, warmth and spontaneity of her concerts. … These fresh performances should stand alongside major recordings of this repertoire. Fialkowska's Chopin is authoritative, dramatic, and, where appropriate, touching. ... A splendid rendition. His collaborator is Janina Fialkowska, whose feeling for line and coloration provides its own flair and authority. Fialkowska's technique is breathtaking. Her runs are dazzling, her fortissimos are thunderous. She is delightfully witty where wit is called for. Nothing seems to present any problem to her. The Montreal-born pianist, internationally praised for her Chopin and Liszt and her interest in Polish romantic and contemporary composers, is a dazzling technician with great musical sensitivity and a keen sense of the panache needed to pull off tremendous difficulties with the appearance of ease. It's an impressive programme, delivered with assuredness and sensitivity. Fialkowska’s fluid technique, her languid arpeggios and differences of touch and sound, combine to create a stunning tonal picture. Impassioned clarity and exuberant sweep ... Fialkowska projects atmosphere and narrative élan with an almost pointillistic brilliance ... Superb. Highest recommendation. Fialkowska ... displays a keen affinity for the music of her father's homeland, not to mention a phenomenal technique in this often fiercely difficult music. A most welcome recording. Fialkowska is a superb advocate of the composer in all his moods and stages, playing with clarity and an intuitive sense of rhythmic nuance. Her ardent performance of the Étude, op. 4 (no. 3), an amorous dialogue that invokes both Chopin and Rachmaninov, is not to be missed. Fialkowska's subtle interpretations bring out the best in this composer. ... The tenderness and vulnerability of Fialkowska's soprano, which 'listens to' and is transformed by the bass's disturbance, is worth the price of the disc, and blows other versions I compared ... out of the water. Janina Fialkowska is an absolute dream of a pianist, and in this repertoire she is also a consummate musician. ... There's no exaggeration, only subtle shaping of every musical idea and phrase. It's miraculous! 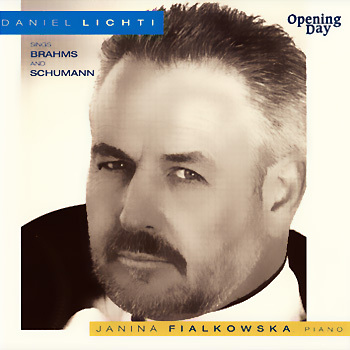 Janina Fialkowska brings dash and flair to this pairing … The vigorous piano writing, designed for maximum impact, gives opportunity for Fialkowska to display her own virtuosity. But she and the orchestra also respond sensitively to the reflective moments in among the thrills. … livre une interprétation consistante, convaincante et fort belle. Ms. Fialkowska, on the other hand has fine technique and a splendid understanding of Schubert and so emerges as at the very least an equal partner, and I sometimes found myself paying more attention to her than to the vocalist. 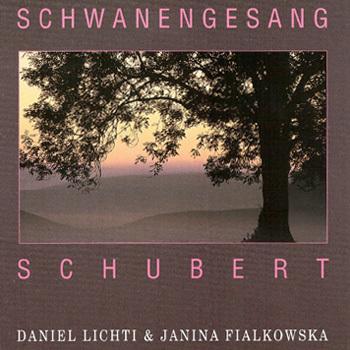 Luckily in pianist Janina Fialkowska he boasts a collaboration equally sensitive to what Lesi De’Ath refers to in his notes as Schubert’s depictive mimicry, his fondness for imitating the actions in the texts through musical gesture. Schubert/Liszt : "Hark, Hark, the Lark"
It has been a long time since I've heard piano playing as good as this! Every aspect of Fialkowska's artistry is astounding. To mention just a few, her interpretive projection of the essence of the music in each work is tremendously satisfying, her prodigious technical polish, always sublimated to the music, is magnificent, and her keen sense of style is captivating, enthralling, at times magical. ... One ingredient of her musicality is a sublime ... singing tone reminiscent of Rubinstein's. ... Here is one of those rare recordings that will yield so much pleasure. ... Do not fail to acquire it for your record library. Fialkowska's Liszt, issued in 1990, stands alone as the finest new piano recording I heard in the decade, 1990-1999. Contains some of the finest Liszt playing I have encountered. ... Fialkowska's greater rhythmic freedom and expressiveness make hers stand above the competition.